Situated in the area Cala Bona, this modern apartment complex is very close to a restaurant. 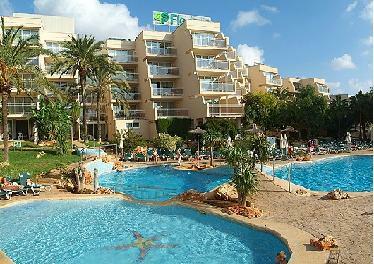 The centre of Cala Bona is a ten-minute walk away; the centre of Cala Millor about 1.5 km. Public transport departs from stops located just 250 m away, whilst the beach, shops and bars are only about 400 m from the complex. The nearest nightclub is about 600 m away. Renovated in 2003, this apartment complex comprises a total of 315 apartments. Guests may make use of the foyer with 24-hour reception desk, hotel safe, currency exchange counter, a cafe?, a bar, a games rooms, cable free Internet access, a kids' club, a children's playground, lifts and TV room. The air-conditioned ? la carte restaurant with a non-smoking area and highchairs for infants invites guests to stop off and indulge in some top cuisine. Those arriving by car may make use of the hotel car park and garage facilities.